It seems appropriate tonight to feature ‘Til Tuesday (often written as ’til tuesday) the American new wave band formed in Boston in 1982. Its original lineup was bassist/vocalist Aimee Mann, guitarist/vocalist Robert Holmes, keyboardist Joey Pesce, and drummer Michael Hausman. Wikipedia tells us, ‘Til Tuesday first gained fame six months after its formation when it won Boston’s WBCN Rock & Roll Rumble in 1983. Their original composition “Love in a Vacuum” (credited to all members of the group) received a fair amount of airplay on the station, and the group was eventually signed to Epic Records. The band became an early MTV staple with the “Voices Carry” video, which depicts an oppressive boyfriend trying to convert Mann to his upper-class lifestyle; she finally lashes out at him during a concert at Carnegie Hall, standing up from her seat in the audience and belting the lyrics, “He said, shut up! He said, shut up! Oh God, can’t you keep it down…?” as she removes her cap to reveal her signature spiky, rat-tailed hair. As a result, the group won that year’s MTV Video Music Award for Best New Artist. By the 1986 follow-up Welcome Home, Mann was beginning to write more of the songs herself and the band was moving away from the slick new wave sound of their debut. But while critical reaction was generally strong, the number twenty-six placing for the lead single “What About Love” was a commercial disappointment, especially after the top-ten success of “Voices Carry”. Even more problematic, the album just barely sneaked into the U.S. top fifty, also a letdown after the number nineteen placing for their first LP. At about the same time, Mann’s two-year relationship with singer-songwriter Jules Shear, whom she had been dating since the release of the Voices Carry album, came to an end. This breakup somewhat informed the band’s final album, 1988’s Everything’s Different Now, particularly in the song “J for Jules”, though Mann insisted that not every song on the LP was about the relationship. Shear collaborated with Matthew Sweet on the album’s title track; it also featured “The Other End (of the Telescope)”, a collaboration between Mann and Elvis Costello on which Costello provides a guest vocal. While critical praise continued to flow, Everything’s Different Now was a commercial dud. The album peaked at #124, while the lead single “(Believed You Were) Lucky” (co-written with Shear) crawled to number ninety-five. ‘Til Tuesday essentially broke up after the release of Everything’s Different Now. However, Mann toured under the ‘Til Tuesday name with various session players while legal problems with the band’s label Epic prevented her from beginning work on a solo record for several years. Hausman, meanwhile, became Mann’s manager, a position he holds to this day. Please enjoy this video clip of ‘Til Tuesday performing their hit song “Voices Carry” in their very first New York City appearance in 1985. 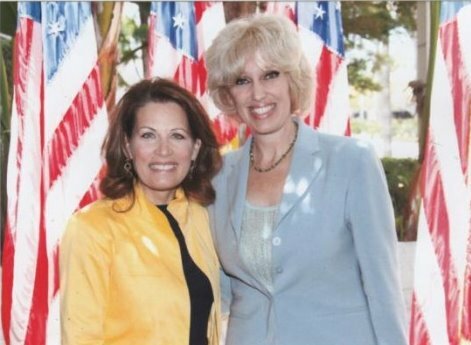 Michele Bachmann (R) MN and Orly Taitz, DDS, Esq.,Real Estate Agent - Two Koo-Koo Birds of a feather. How do the crazies always seem to find each other? And why in the world do they always commemorate the occasion with a photo when they do? These are some of the unanswered questions that have plagued the political world for some time. Remember the photos of Sarah Palin and Joe the Plumber? How about those of Palin and Michele Bachmann? Palin and Glenn Beck? Bachmann and various Tea-Baggers? Palin and assorted Tea-Baggers? Bachmann and Michelle Malkin? And most recently, Palin and Arizona governor Jan Brewer? Well, just look above and see the newest crackpot photo to hit the blogosphere. Yup, once again it is Minnesota’s moonbat crazy Republican Senator and member of the “Birther” movement, Michele Bachmann and the wackiest “Birther” of them all, Orly Taitz, the dentist/lawyer/real estate agent. Taitz, you might recall is the person who has filed multiple lawsuits seeking to have President Barack Obama removed from office because she alleges he was not born in the United States. Of course all of her lawsuits have been dismissed involuntarily and Taitz has been reprimanded on at least one occasion by the Court. It appears that the above photo was taken on May 14, 2010 at a luncheon in Irvine, California which was attended by both of the fools. It was almost immediately posted on Taitz’s personal website. Driving voters from the G.O.P.